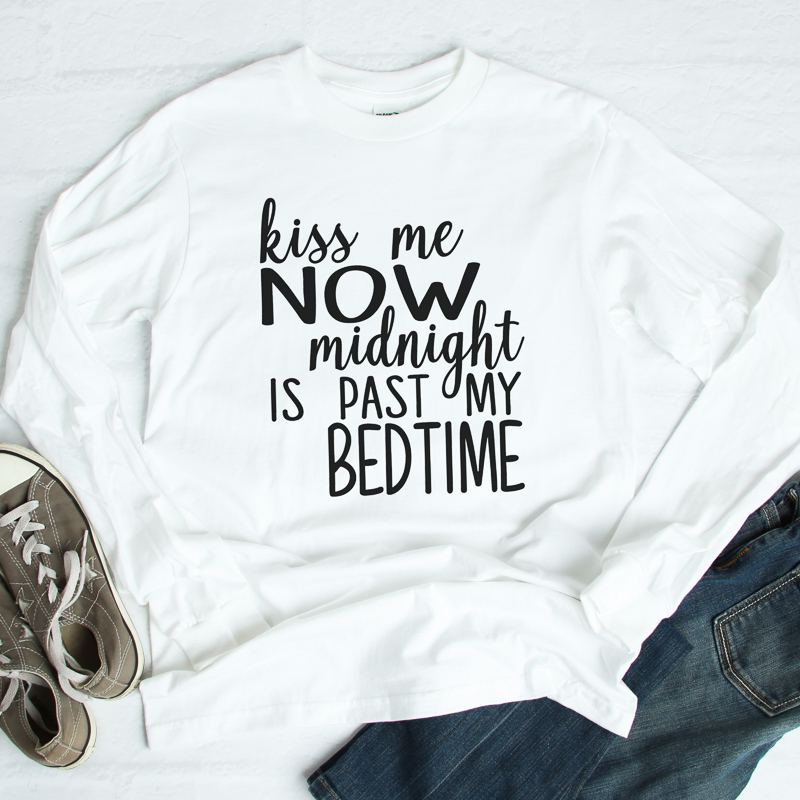 Make your own New Year’s Eve tops with this free SVG file and your Cricut or another cutting machine. I am joining up with several other bloggers again this month to bring you some free SVG files that you don’t want to miss. You can get this kiss me now file below then scroll to the bottom to see the other ones as well. Then use the free cut files for all of your crafting needs for New Year’s Eve. Download the SVG file to your computer then upload it to the software for your cutting machine. You can see how to do this for a Cricut machine here. Then mirror the design and cut from your iron-on material. Be sure to put the material shiny side down on your mat. You will then need to remove all excess vinyl including the centers of all of your letters. Iron to your shirt using the Cricut EasyPress or an iron. I prefer the EasyPress for my projects but you can use an iron if you wish. I also have a post here comparing the EasyPress to a heat press if you need it. Then just enjoy your New Year’s Eve tops that you made yourself! I did this particular design because it is so me y’all! Seriously, I can never make it to midnight on New Year’s Eve. What about you? 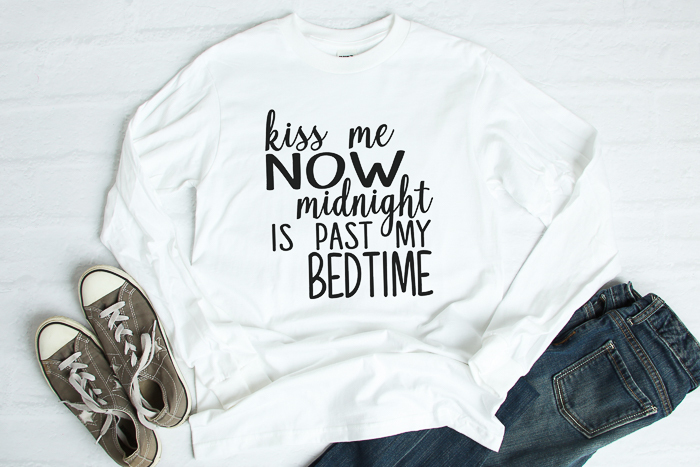 Do you stay up and party or are you in bed way before the clock strikes midnight? Now, I promised you some more New Year’s Eve SVG files. 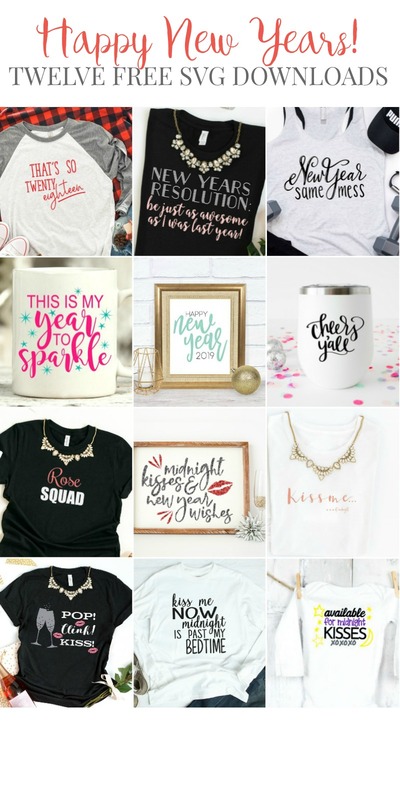 You can see there is tons of fun in addition to these New Year’s Eve tops! 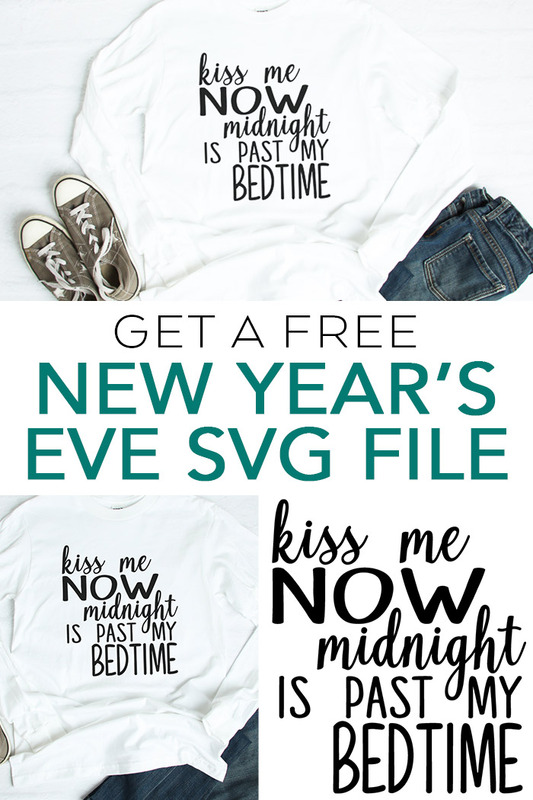 Now go make some New Year’s Eve tops or some other projects with these SVG files! I just love this! Midnight is definitely past my bedtime. Pinned. That is darling!! Midnight is past my bedtime these days, too. 🙂 Pinned! Haha too cute, I love it! I want a Cricut, I had a silhouette but could hardly ever get it to cut. I don’t have a lot of patience which is horrible but I’d love to try my hand again. Thank you so much for sharing this. I can’t wait to make my own.